With over 5000 properties listed online, Cape Town is Airbnb’s biggest market in Africa. It’s a fantastic way to earn extra income from a property but it isn’t without difficulties. Many of our customers tell us that playing host whilst they themselves are out of town is tricky, not to mention the worry that something might go wrong. What if the geyser bursts, the alarm is triggered or the guests lose their key – these are all hassles that take the fun out of short-term property rental. Here’s where we come in. From as little as R150 per night, we provide a tailor-made Airbnb management service to suit your needs – taking the stress out of hosting. We offer a selection of pricing packages allowing you to pick and choose only the services you want. We can take care of things like check-in and check-out, laundry and cleaning services. We also provide a unique, 24 hour property maintenance service – we guarantee to keep a qualified tradesmen on call to attend any emergencies at any time of day should the worst happen. We offer 2 basic packages, both of which have optional extras which can be added at the point of purchase or during your guests’ stay, depending on what you need. All our Airbnb management packages are priced per night, with a 3 night minimum booking – although discounts are available for longer stays. If you’d like to discuss management of a longer-term rental then we’d be happy to discuss options with you. 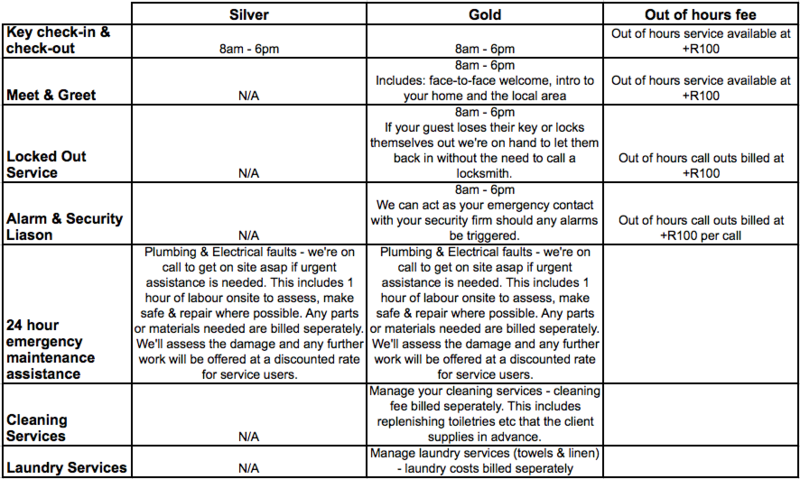 If you’re looking for a particular service that isn’t listed above, please get in touch with us to discuss how we can put together a bespoke package to suit your specific requirements. To book any of our Airbnb management packages – or simply to find out more – call 071 319 2831 or fill out our online enquiry form now, and we’ll be in touch shortly.